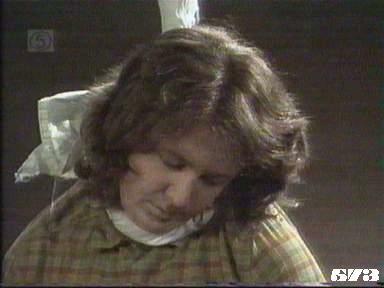 The doctors examine Daphne following her attempted suicide, but she promptly turns on them. Joan gets home to find Terri in bed with a man. Nikki gets caught by the police, but is then released. The women chase Cindy who takes refuge from them in Daphne's cell, where she finds Daphne hanging from the ceiling . Terri hears Joan leave and panics, which makes her boss wonder if she's really married. Nora uses her nursing experience to revive Daphne. May then faints from shock (or loss of blood?) Terri tells her boss she needs time and doesn't want to rush things. Cindy blurts out in front of Meg that she didn't mean to do it, but May and the others don't say anything. Cindy's parents are called to Wentworth. Nikki arranges to meet her mother in a pedestrian underpass: her mother pleads with her to come home, but Nikki is too scared that she'll be traced by the police and sent to Wentworth. Ann tells Cindy's parents she may have to face an assault charge if it is proved that she attacked May. When questioned by Ann, however, May invents an ingenious story to cover for Cindy, claiming to have fallen on a knitting needle. Cindy is therefore cleared of the charge and asks to be allowed to finish the programme so the women won't think she's chickened out. Rather belatedly, the women start to worry about Daphne: Julie says her condition couldn't have been too serious or she'd have been taken to hospital. Nikki calls on Queenie, who agrees to get May and Willie to use someone else to dispose of the prison guards if Nikki will go ahead and pick up the guns. Joan is brusque with Terri when she comes home from work and goes to bed early. Queenie takes Nikki to pick up the guns, but the planned "narrow escape" goes wrong and they are caught by the real police. At the police station, Queenie has to act tough in front of Nikki, causing the detective much puzzlement. Terri gets a call from Meg who tells her that Joan didn't work her late shift the previous day and realises that Joan must have found out, so she goes to Joan's room to tell her about her affair. Joan decides to give her another chance, and even suggests she could carry on seeing Barry so long as she doesn't tell her about it. Queenie asks the police to let Nikki off after scaring her. Nikki turns up for Wentworth next day, to the surprise of the police, Cindy and Ann when she is told. Daphne still feels very low even after Ann tries to boost her self-esteem by reminding her of the work she's done. She is then told that other doctors will be examining her with a view to proving that she doesn't suffer from PMS after all. Nora, May and Willie carry on with the absurd charade about an escape until Nikki pleads with them to let her off. Joan is moved to unburden herself to Meg after she makes a polite enquiry about Terri's new job and mentions that she's heard from Dennis who is slowly recovering. Fortunately for Joan, she is saved by a call on the staff room telephone just as she is about to really talk about her feelings. Daphne is examined: the doctors upset her (and even Meg) with their arrogant and agressive attitude until she smashes the surgery drugs cabinet door and threatens them with a piece of broken glass. Eighties junk culture note: Nigel hands Tiny a Rubik's cube to solve, complaining it's too hard for him. Although invented in 1974, it didn't catch on outside Hungary until 1980.